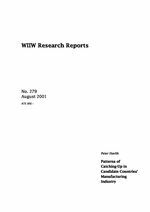 This paper analyses the structural changes that have taken place in CEE candidate countries' manufacturing industry during the last decade. In the more advanced candidate countries for EU membership, industry has been able to recover at least part of its previous position thanks to active restructuring and privatization efforts, fostered especially by inflows of FDI. Employment declined more than output and over five million manufacturing jobs were lost in the region between 1990 and 1999. Production specialization has markedly increased between 1990 and 1999 in nearly all candidate countries. The top five branches account for 60% to more than 70% of manufacturing industry output. The structure of manufacturing industry in the majority of candidate countries is now fairly close to the European pattern both in terms of production and employment (exceptions are Bulgaria, Romania and the Baltic states). A new pattern of productivity winner and loser branches is emerging: winners are electrical, optical and transport equipment as well as furniture; losers are food and beverages, textiles, leather, wood products and chemicals. Hungary is a productivity leader among the candidate countries; Bulgarian and Romanian labour productivity is just one fourth of the Hungarian level. In several countries wages are growing faster than productivity, implying a gradual deterioration of the international labour cost competitiveness (except Hungary and possibly also Poland). The winner branches have managed to increase their comparative cost advantages vis-à-vis the present EU member states. But some loser branches - such as textiles, leather and wood products - face clear cost problems and may well have higher unit labour costs than Western Europe. Manufacturing industry has been an important target of FDI in the candidate countries, but the sectoral distribution of FDI is highly uneven. FDI has a clearly positive impact on output growth, labour productivity and ULC improvements.